- "One Family's Fighting Spirit"
I need your help to battle a terrible disease called Niemann-Pick Type C that has deeply affected my family. During my years of coaching football at the University of Notre Dame and other institutions as well, each spring was dedicated to recruiting and rebuilding my team and each fall was dedicated to fighting for every yard to be victorious. At this time in my life, that process has particular significance, but we are no longer playing a game. I am asking for your support and that of your family and friends as we commit to victory against Niemann-Pick Type C, the neurodegenerative disease that has claimed the life of my three youngest grandchildren. Cowboy Michael lost his battle to NP-C in 1997 at age 9. Sweet Christa passed away in 2001 at the age of 10. Our precious Marcia died in 2005 at the age of 16. We miss them so much. 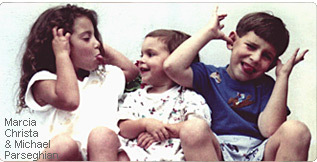 Thankfully, we've come a long way since the children were first diagnosed and we launched the Ara Parseghian Medical Research Foundation in late 1994. Scientists funded by the Parseghian Foundation identified the gene responsible for causing NP-C1 in 1997. This discovery has played a major role in helping researchers take Niemann-Pick research to a new level. We have funded more than 60 labs around the world and we are moving the ball down the field toward the goal line...a treatment for NP-C is our goal...A Goal For Life. We are currently funding more than 25 labs that are all working to unravel the mystery of this disease, and to find potential treatments to save the lives of all those afflicted. Many of our researchers are screening countless compounds and approved drugs to determine their effects on intracellular cholesterol processing. Other researchers are studying the neurologic basis of the disorder while others are studying the cell biology specific to NP-C.
We have a number of potential candidates in the "pipeline" and feel that it will be a combination of therapies that will eventually slow or stop the progress of the disease. Of course, our hope and prayer is that this combination of therapies may actually repair some of the damaged cells...so the children will actually get better. As I review our accomplishments over the past 14 years, I am overwhelmed with pride and gratitude. I am proud to have witnessed the establishment of an extraordinary organization of researchers, board members and volunteers who tirelessly exhibit an unparalleled level of commitment to curing a devastating disease. Most of all, I am inspired by the pure goodness of the human spirit, which has touched our family over and over through innumerable cards, letters, prayers and donations. Our hearts are broken. The pain of losing our three youngest grandchildren is almost unbearable. I think of other grandparents whose grandchild has recently been diagnosed with NP-C. We will keep up the fight for them and all families afflicted with this terrible disease. And now, as we strive toward our goal for life, I need you to be a vital member of our team and share in the ultimate victory. We welcome your tax-deductible contribution and your support in every way possible. Thank you and God bless you.